Native Men’s Wellness Program interns participate in workshops that foster wellness in all areas of life. 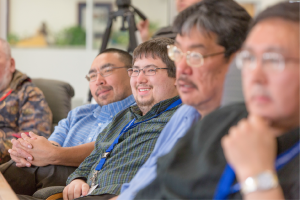 Southcentral Foundation’s Native Men’s Wellness Program supports men dedicated to changing their circumstances by embracing a new level of accountability, determined and set by individual participants. This step-up in life is not a handout, but a hard-earned progression toward fulfilling their potential. Each person achieves their goals with culturally-appropriate training and experiences directed by the program. NMWP helps men of all ages reach employment goals, embrace healthy living, and become a contributing community member and leader. This is the third year of the Training Education and Development Experience (TEDE) grant from the Administration of Native Americans, a program that provides education and training opportunities that are culturally relevant to its Alaska Native and American Indian participants. September 30 marks the completion of the 3rd NMWP cohort, serving a total of 122 men and their families since it began in 2014. NMWP has helped participants along various journeys: going from homelessness to steady employment and increased wages; from grief to steady work with the opportunity to share cultural and practical knowledge with others; from recidivism to community service; and from lack of experience to internship and employment. Many NMWP participants have found steady employment with various employers in Anchorage, including SCF. Several participants have also given back to the community by presenting their story as guest speakers during the monthly luncheon, Our Stories, We Share. This luncheon is held for men and women to connect and share thoughts on issues that concern the entire community. Other NMWP activities that participants have access to are Cultural Activity Night, You Are a Warrior workshop, Life Skills learning circle, Men’s Health Week activities (held every June), mentorship, and peer support. For more information about the Native Men’s Wellness Program, call (907)729-5208.